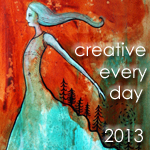 Ways to share: Once you've signed up, you can leave a comment on this post and/or use the "Mr. Linky" widget below to link to a blog post(s) about your creative activities during the days of 6/3/13 - 6/9/13. Theme: June's totally optional theme is Childhood, which you read more about here. I’m excited to see another week of gorgeous creations. I’m enjoying re-visiting some of my more “child-like” or child-inspired drawings and painting with our June theme. Thanks, Leah!